Still fresh from their exodus out of the Eastern United States, the Mormon settlers were not exactly welcoming to outsiders arriving in their newly-founded Utah Territory, and it was likely this irrational xenophobia that led to the Mountain Meadows Massacre of 1857, an act of brutality that is today marked by a pile of stones as the event’s only memorial. The deadly debacle began when the Baker-Fancher group of emigrants, heading from Arkansas to California, arrived in Salt Lake City looking to resupply for the last leg of their journey. 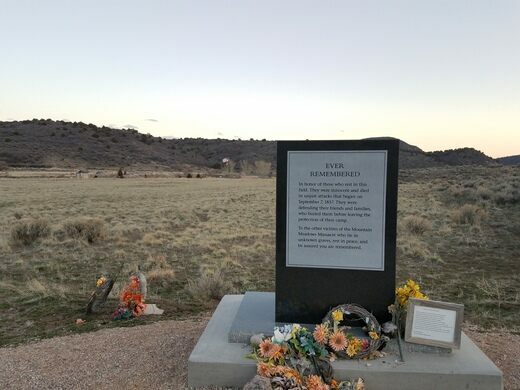 Nearly 120 people strong, the wagon train was rebuffed by suspicious Mormon government of the time and the party quietly left to continue south down the trail. However, word of the party traveled fast, quickly picking up an air of hostility and conspiracy as it passed among the tightly-knit religious settlers. By the time the Baker-Fancher party reached Mountain Meadows, a well-known resting spot on the trail West, they were running low on supplies and were happy for the rest. Unfortunately, rest would not come as local militia groups had already cobbled together a plan to deal with the irrationally-feared interlopers. Enlisting the help of a few local Paiute American Indians, and dressing up the militia members to look like them as well, the militia led a raid on the camp on September 7, 1857, hoping to make it look like a random Indian attack. The emigrant party circled wagons and fended off the initial attack. However, the assault continued for five more days, slowly depleting the emigrants’ supplies and ammo. Even though the Baker-Fancher party was nearly spent after a week of fighting, the militiamen began to fear that the surviving emigrants had identified some of them as white men, which would implicate them in the attack. The decision was made to wipe them out. On September 11th, the militia members entered the Baker-Fancher party feigning surrender, and convinced the surviving settlers to follow them to town. Once the train was a fair bit into the wilderness, a signal was given and every one of the men, women, and children over the age of seven was gunned down. The remaining children were farmed out to local Mormon families and the entire event was blamed on the Paiutes. Luckily the truth was soon found out and the militia leader was tried and sentenced to death. Some of the remaining children were returned to their relatives, while others were taken in by the Army. In the end, the entire horrid event stands as a black mark on Western, Mormon, and American history. 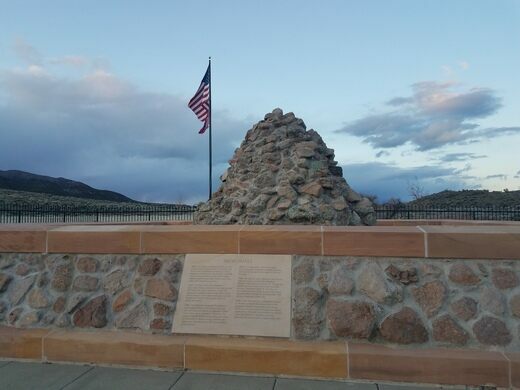 Today, a large monument is in place on the site of the original grave cairn. 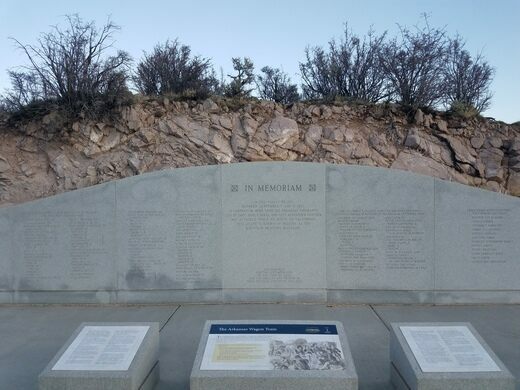 Before the current monument there had been a series of memorials, including a name wall and a bronze plaque, but the current pile of stones on the site was put in place by Mormon leadership in 1999. They maintain it to this day. A museum has some wedding cake dating to the Teddy Roosevelt administration, and some bacon from FDR's. A monument to a survivor of harsh pioneer life, frostbite, and primitive surgery.